Not long ago I came across a blog entry by Michelle Schoffro Cook called “Advice from an African Medicine Woman.” The piece suggested a way of healing the earth that entailed filling a bowl with water, praying over it, and releasing it back to the earth. Do this for 30 days, she said, and be open to the alchemy of it. This seemed like a manageable and easy way to do try to meditate with my kids. I was talking to my younger sister on the phone recently and she said that she thought raising happy children boils down to three things: sharing meals, playing, and meditating with them. I’d been writing a lot of letters to government officials about water—I love the ocean, which seems like such an incredible gift this planet’s been given, and I feel the same way about the lakes that define the area where I live with their moody blueness. Lately it seems like every time I turn around someone or something wants to drill in them, or put a gas storage facility underneath them. Or we just dump all of our plastic in them, making giant islands that nothing, not even the sea, can completely break down. So I thought I’d try praying over a bowl with my kids. We went into the kitchen, chose some dusky blue bowls that once belonged to my grandmother, and filled them with water. We prayed for flow, for peace, for healing of the ocean. “Now go outside and pour your water on something that’s alive,” I said. “Can I pour it on the cat?” said my second grader. “This is heavy,” said my kindergartner, trying to carry his bowl. “I know, sweetie,” I sighed. I know. “It is kind of heavy,” I said later on the phone to my sister Emily, the one who suggested meditating with children in the first place. Then we started talking about the rituals we’d done as kids—eaten together every night as a family, worked in the vegetable garden, fed the chickens in the morning. Cut wood every weekend. “Of course, we all hated cutting wood,” my sister said. But what those rituals did do was cultivate the seed that was already there: a love for being outside, for plants and animals, an appreciation for the natural world. 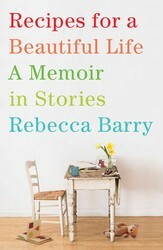 Writing with a delicate balance of humor and truth, critically acclaimed author Rebecca Barry reflects on motherhood, work, and marriage in her new memoir about trying to build a creative life.When Rebecca Barry and her husband moved to upstate New York to start their family, they wanted to be surrounded by natural beauty but close to a small urban center, doing work they loved, and plenty of time to spend with their kids. But living their dreams turned out not to be so simple: the lovely old house they bought had lots of character but also needed lots of repairs, they struggled to stay afloat financially, their children refused to sleep or play quietly, and the novel Rebecca had dreamed of writing simply wouldn’t come to her. Recipes for a Beautiful Life blends heartwarming, funny, authentically told stories about the messiness of family life, a fearless examination of the anxieties of creative work, and sharp-eyed observations of the pressures that all women face. Rebecca Barry is the author of Later, at the Bar: A Novel in Stories, which was a New York Times Notable Book and a Barnes and Noble Discover Pick. Her nonfiction has appeared in numerous publications, including The New York Times Book Review; The Washington Post Magazine; Seventeen; Real Simple; Food and Wine; Saveur; More; O, The Oprah Magazine; Hallmark; and The Best American Travel Writing 2003. She is also a writing coach, and cofounder of the magazine Fresh Dirt.